This site documents our new adventures while traveling full time in our 2017 Airstream Flying Cloud travel trailer. We hope to share our travel and experiences with our friends and family. We have spent the last week parked here at the Meaher State Park, in Spanish Fort Alabama. We arrived at our waterside camping spot, greeted by four allegators patrolling the shore. On most mornings they are there sunning in the shallow waters of Ducker Bay, which is a smaller part of the Mobile-Tensaw River Delta. This is the little sister to the larger Mississippi River Delta. It is home to a massive amount of flora and fauna, including those alligators, who prefer the shallow water and mud bottoms that make it easer to catch fish. Better the fish than us. Knowing nothing about this area we decided to take one of the several city tours which provide a good overview of Mobile. We took the Trolly Tour with Gulf Coast Tours, hopping aboard at the Fort Conde visitors center. We spent the morning getting an overview of Mobile's historic districts, as well as finding our city bearings. After the tour, we walked the neighborhoods, finding our way to Callihan's Irish Social Club, established 1946. My Bride had a burger and a Fat Tire, I had a Shrimp Po Boy and a Guiness. How good those beers tasted in the south Alabama heat! Mobile will tell you, that it is HERE that Mardi Gras was born. They held the first organized celebration in 1703. There is museum to Mardi Gras in town and a new Mardi Gras Park to mark that history. We saw evidence in Spanish Plaza to the city's Mardi Gras roots. Mobile has a strong Spanish heritage, which maintains strong ties with Malaga, their sister city in Spain. The Spanish Plaza honors those ties. We strolled the Church Street Graveyard where some of the first settlers are buried following a yellow fever outbreak. Many of the tombs are above ground crypts. I don't know if that was because it was their custom or because of a high water table. In any event, it was a peaceful place to walk. We found ourselves in Moab Utah a week earlier than a scheduled Mountain Bike Adventure with our son and his boys. It could have been worse! We took full advantage and visited these the two National Parks that are in the neighborhood. One of the realities of how we travel is that we often run into the unexpected. It this case it was Easter Jeep Week Safari, Moab's largest gathering of off-roaders of the year. We were lucky to find a campground that had room for us. There were Jeeps of all types, modified to drive anywhere. A bonus was unexpectedly visiting friends from Nederland. Paul and Amy who are THE Adventure Tool Company. They had set up shop at the Jeep Week Expo, and maintained a brisk business. What fun it was seeing them here. They have some of the best tool bags and accessories you will find. Between Bend Oregon and La Grande Oregon you can find the John Day Fossil Beds National Monument. It covers 40 Million years and over 14,000 acres in three separate park units. We visited only one of them, the Painted Hills. We based out of the seemingly miss-named Fish House Inn and RV Park in Dayville. We located in one of their "overflow" sites which despite lacking hookups, was the choice spot in this small park. We started the trip of a lifetime with a delay. It seems the Blue Angels were practicing for an airshow in Seattle. That resulted in Air Traffic Control issuing a ground-stop keeping us on the ground in Spokane for nearly two hours. That put us into Nairobi a day later than planned. Almost a year earlier, Jacqui Kaufman convinced us to join the Kenya Marathon Tour offered by MarathonTours & Travel. This was a trip she has lead for years. My running days behind me, we went for the Game Camps, and the Game Drives that are add on's to the Amazing Maasai Marathon that benefits the secondary education for Maasai girls. 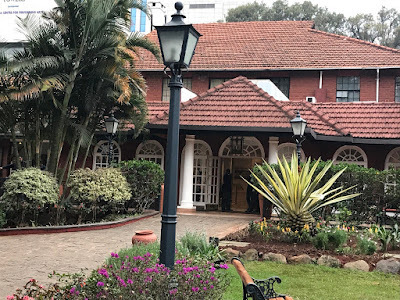 We arrived in Nairobi Kenya on August 4th and spent the next twelve days enjoying a trip of a life time. Our first night was a short one spent at the beautiful Norfolk Hotel. In the morning we met Kim and Rick, soon to become friends, and slowly the others on the tour.